Judy Garland wasn't meant to play the part of Dororthy in The Wizard of Oz. Shirley Temple was the lead contender, but 20th Century Fox refused to lend her to Metro-Goldwyn-Mayer. Judy Garland's real name is Frances Gumm, and nicknamed "Baby" Gumm because she was the youngest child of three girls. She was advised to change her name to Judy Garland as a teenager, because whenever "Gumm" was announced, the audience would laugh. Judy Garland began working in demanding jobs when she was just over two years old. Her resume is packed with many achievements and employment history as a singer, actress, concert performer and TV show host. Judy Garland's lead role as Dorothy in The Wizard of Oz won her an Academy Juvenile Award. These were rather sporadically awarded from 1934 until 1960. Only 12 people in the world have ever gotten one, including Mickey Rooney and Shirley Temple. The Juvenile Awards were mini versions of the full-sized statuette. Judy Garland sang her Academy Award winning song, "Over The Rainbow" more times than any of her songs during her life. US President John F. Kennedy would call her at times and ask her to sing "Over The Rainbow" to him over the phone. 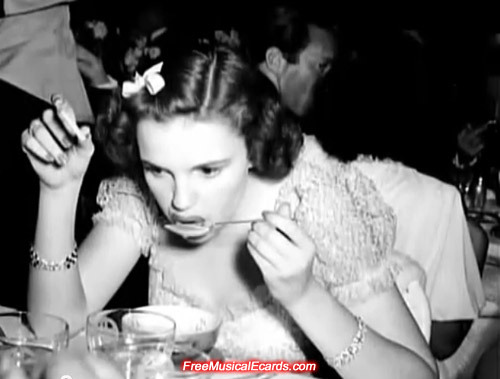 Judy Garland's favourite foods were steak and kidney pie. Her favourite drinks were black tea and vodka. MGM boss, Louis B. Mayer and her mother Ethel controlled what she ate, to keep her weight down for her next movie shoot. 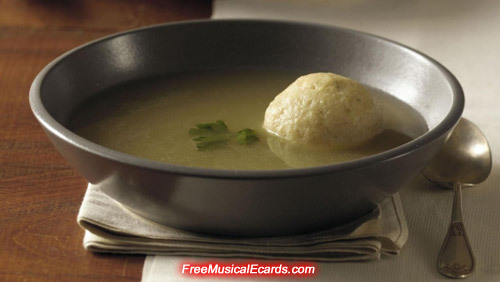 No matter what she ordered at MGM Studios cafeteria, the staff was instructed to serve her only chicken soup with matzo balls. The reason why Miss Garland called it a "prisoner's menu." Interesting fact. I didn't know she sing "Over The Rainbow"
It's her song and what she is best known for singing. 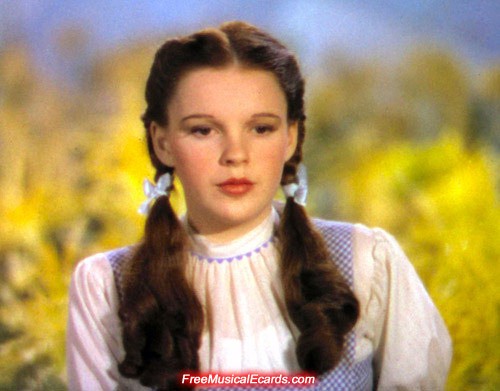 Other people sang it in the past, but Judy Garland was the original singer of "Over The Rainbow". That is a good song and classic. She has a very good voices. 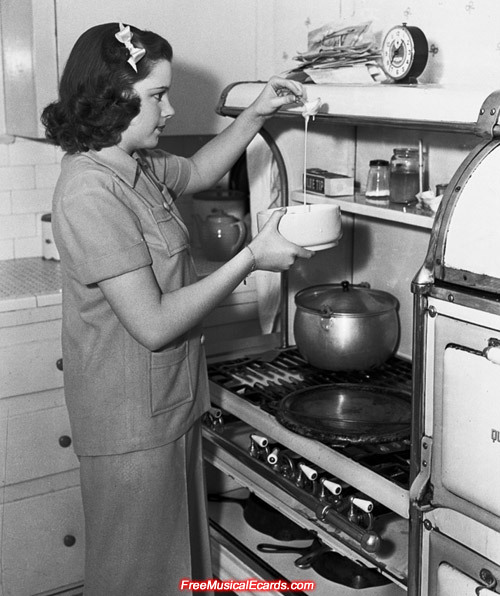 In spite of Judy Garland's success as a singer-actress at MGM studios, she is not neglecting her domestic duties and her mother, Ethel Gumm, is making sure of that. A young Judy Garland is seen here preparing some flapjack (pancake) for breakfast before leaving for the studio on 24th August, 1938. Was Dorothy a good wife and mother ? 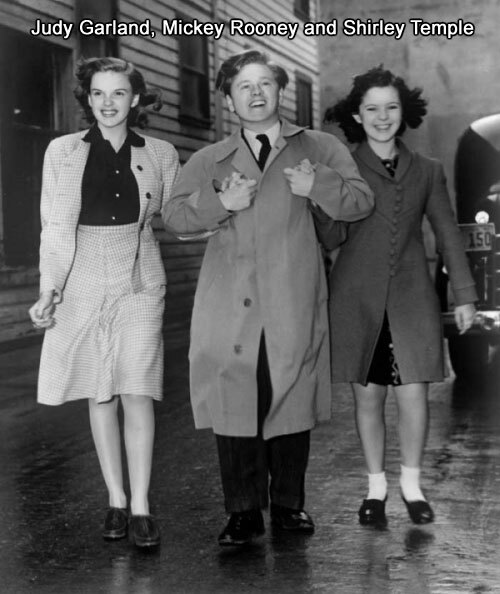 Judy Garland had her ups and downs like in any family. She looked after her children and husbands very well and there have been occasions when she wasn't her usual self, but at the end of the day her three children still loved their mother very much, and their mother supported them. I'll have to give her a tick for good.